Hi everyone! It’s been absolutely ages since I updated my blog. So. What’s been happening? 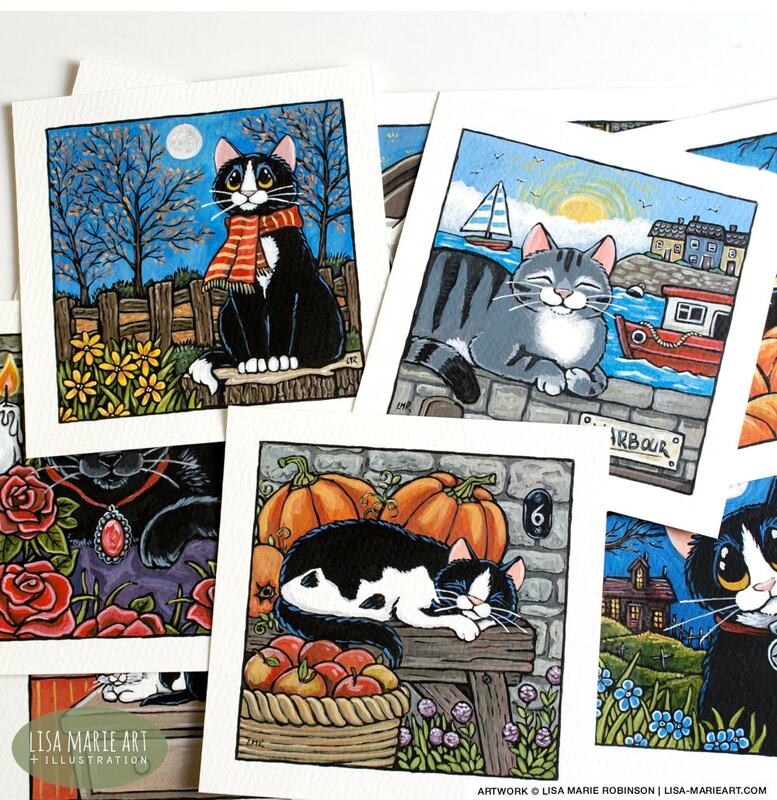 Well as you can see I’ve been hard at work with a new order of cat paintings for Whitby Galleries. With Autumn on the way, this month’s main theme was Autumnal Cats, Gothic Cats, and a few Halloween Cats! I’ve also been playing catch up with my other projects as I hurt my shoulder a few weeks ago and couldn’t move my beloved painting arm for over a week! I’ve absolutely loved painting this month’s Whitby order. My favourite season, my favourite spooky time of year, and I’m a closet Goth! Love all the gothic paraphernalia. I’ve got celtic skulls, candlesticks, etc, but let’s get back to the kitty paintings! I wan’t allowed to go full on gothic so everything is rather toned down. 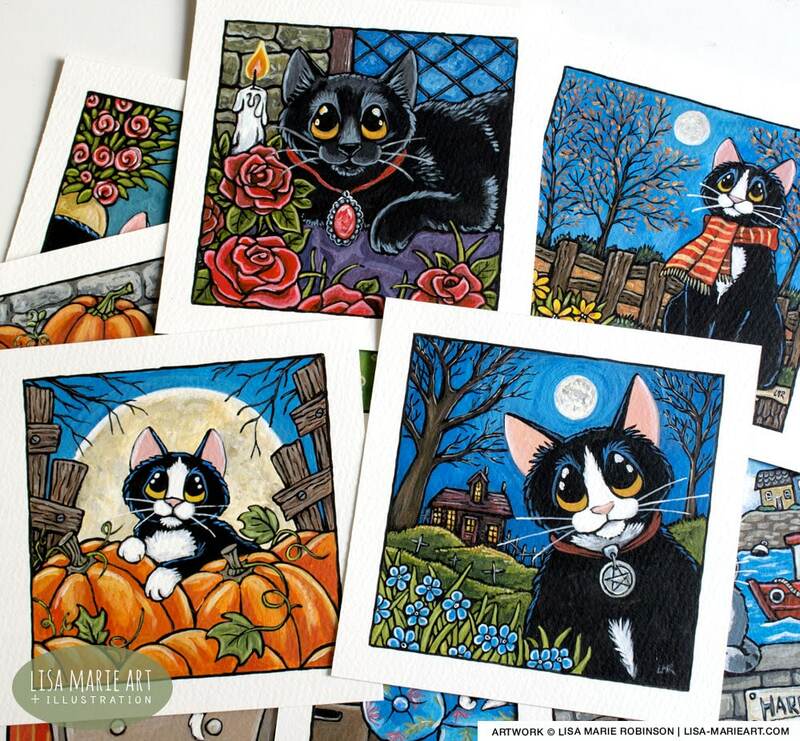 My favourite is Briar, a full black kitty wearing an ornate pendant surrounded by roses. House on the Hill is more Halloween than gothic and features a tux kitty wearing a pentagram pendant with a spooky wooden house in the background. Looking for the Perfect Pumpkin is exactly that. A kitty in a pumpkin patch because it’s not Autumn without pumpkins! Those pumpkins make another appearance in After the Harvest. This one features a sleepy black and white cat snoozing on a bench surrounded by a fresh harvest of pumpkins and apples. The last Autumnal kitty painting is called One Autumn Night and features a scarf-wearing tux out in the countryside. He’s sitting on a freshly cut tree stump surrounded by balding trees in shades of orange. Love the colours in this one! Moving on to the non-seasonal paintings, first up is The Harbour. I’ve concentrated on black and white cats this month and The Harbour has the only tabby cat for this order. This one is as simple as a kitty enjoying the harbour. Water, boats, seagulls, little houses in the distance. I’ll be starting some more larger pieces for the galleries very soon and I think this would be the perfect theme for one of them. Moving indoors now to a bunch of tuxedo cats who are mostly lounging around. Vanity speaks for itself. A rather vain kitty admiring himself in the mirror while his friend couldn’t give two hoots. Sweet Dreams features a sleepy kitty tucked up soundly in bed. The Reading Chair features another lazy cat chilling, on a rather comfy looking armchair, beside a unit full of books. Last but not least, Twins doesn’t really need an explanation. Two identical tuxedo kitties in a floral setting. 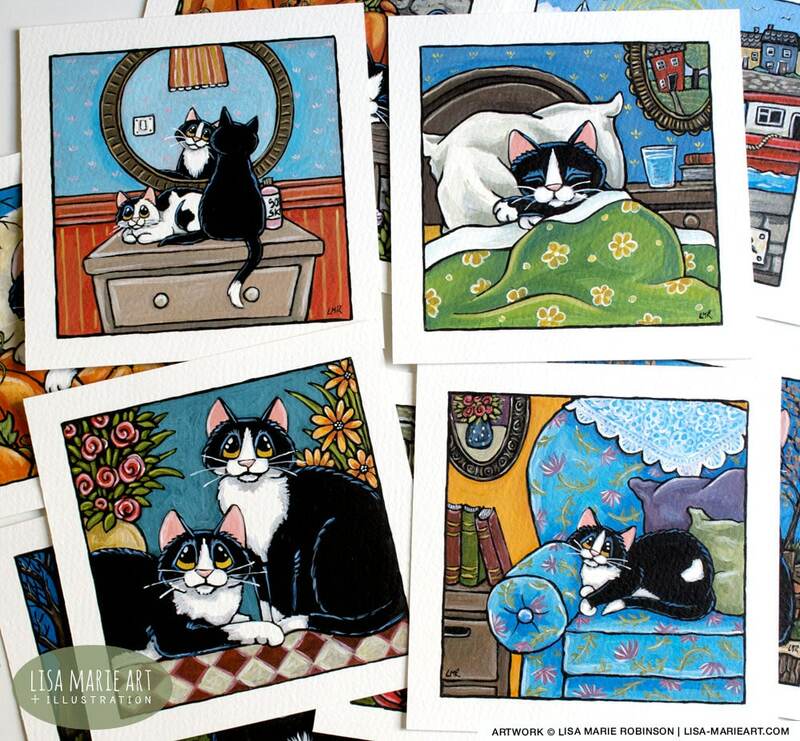 You can find all of these kitty paintings at Whitby Galleries right now. They are located at 134-135 Church Street, Whitby, UK. All the paintings have been professionally framed with a simple black frame and mount. The artwork measures approx. 5″ x 5″ and orders can be taken by phone or email. Home delivery in the UK can be arranged (please ask about international delivery) or you can simply pop in-store to make your purchase! Please contact the galleries directly for more information and availability of any of the paintings shown above.